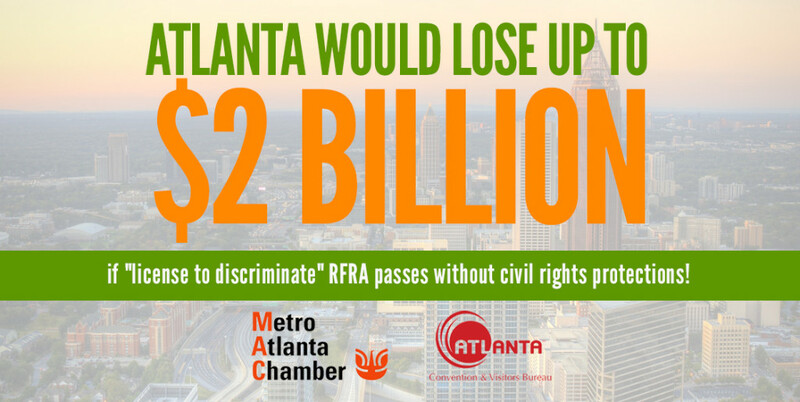 Two separate studies commissioned by the Metro Atlanta Chamber and the Atlanta Convention and Visitors Bureau have found proposed “religious liberty” bill could have sweeping implications for Georgia’s economy—to the tune of $2 billion in lost revenue—if it passes. Senate Bill 129 would allow individuals and businesses to use their religious beliefs as an excuse to discriminate against others and refuse service. The studies examine economic fall-out in other states that have implemented similar legislation and two polls (conducted by Meetings & Conventions and Successful Meetings), which found that about 45 percent of polled convention planners would cancel an event in a city where a law was passed that many of their attendees found offensive. We want to send the message that Georgia is a welcoming state. It’s good for economic development, which is good for jobs, which is good for Georgia families. This study … allows all of us to go into the upcoming legislative session with eyes wide open as to what the potential economic risks are if Georgia doesn’t get this right. And Georgia stockholders could lose an average of 4 percent on investments in companies targeted for consumer boycotts. All told, the tourism industry is projected to be hardest hit by backlash to discriminatory Senate Bill 129 should it pass. Up to 4,000 jobs are expected to be slashed resulting in $450 million in lost direct spending per year and $400 million in lost business sales. This evidence is important and relevant. This is a serious policy debate that can have far-reaching implications for hardworking Georgians in every corner of this state and will be treated as such. Both the Metro Atlanta Chamber and the Atlanta Convention and Visitors Bureau have come out in opposition to the proposed legislation. A similar bill was introduced last year but stalled in committee in the wake of national criticism from business behemoths of a similar bill that passed in Indiana. Click here to tell your lawmakers to reject SB 129 to keep Georgia fair and open for business to all.